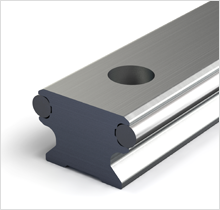 An high-precision aluminum base element accommodates hardened and polished precision steel shafts that are used as tracks for track rollers. The special rolling-in process ensures the extremely robust bond of the steel shafts to the aluminum base element. The parallelity values specified are determined using differential measurement. 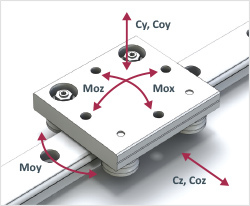 The straightness values of the finely aligned support rails are better than DIN EN 12020. 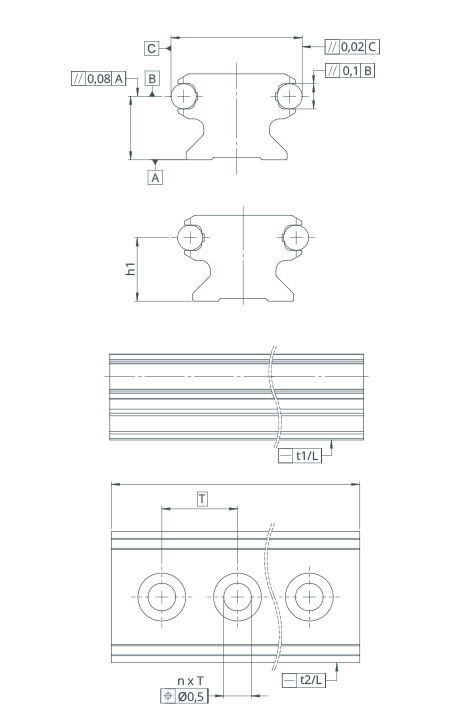 If not otherwise stated, the support rails are supplied with a symmetrical hole pattern. 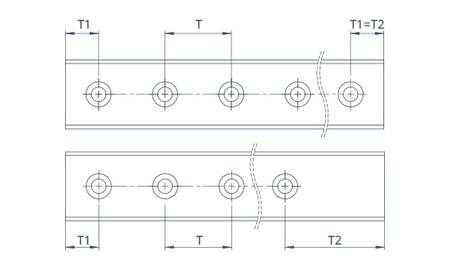 An unsymmetrical hole pattern can also be provided upon request; in this case the minimum distances T1 and T2 must be observed. All ELFS support rails are also available without holes: code OL. For high loads, use washers that meet DIN 433 requirements. If installed with no side stop, comply with permissible side loads. 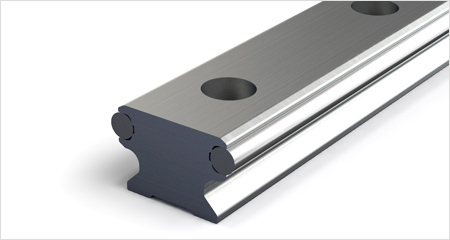 Under certain conditions of use, such as vibrations, alternating loads under high acceleration in combination with too soft connection structures, or incompletely supported support rails, the rolled-in steel shafts may drift by several millimeters in the aluminum base element. 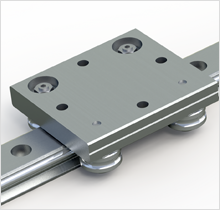 Where necessary, a positive self-locking axial support is recommended.